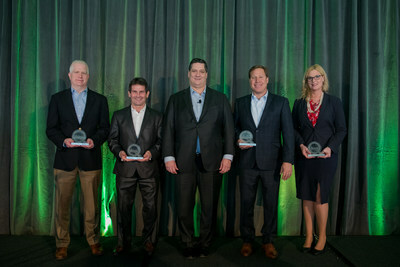 SECAUCUS, N.J., April 3, 2019 /PRNewswire/ -- Quest Diagnostics (NYSE: DGX), the world's leading provider of diagnostic information services, today awarded Supplier Excellence awards to four companies at its 2019 Supplier Forum. Supplier Excellence awards recognize world-class products, systems, or services that provide consistent and reliable performance; companies that develop and implement novel solutions to move the business forward; individuals who step up to the challenge and excel in creating a proactive partnership; and organizations that drive positive change in the market. Four companies were recognized for their contributions to Quest while displaying behavior consistent with the company's values of Quality, Integrity, Innovation, Accountability, Collaboration and Leadership. The awards were given during a meeting which brought together senior executives from over 40 key suppliers. "Our suppliers and partners have a seat at the table in helping us to deliver on the promise of empowering better health with diagnostic insights," said Jim Davis, Executive Vice President, General Diagnostics. "Driving operational excellence is a foundational element of our two-point strategy in addition to accelerating growth, and we rely on our partners to help us enhance the customer experience and drive efficiencies." Cielo Inc. – Provides talent acquisition support which reduced turnaround time to fill vacant positions. Based in Brookfield, Wis.
Roche Molecular Diagnostics – Provides specialized, high throughput FDA-approved clinical platforms for molecular testing which enabled more effective, efficient operations in many Quest laboratories. Based in Indianapolis, Ind. Sysmex America - Provides clinical solutions that have yielded improvements to operations and enhanced the customer experience. Based in Lincolnshire, Ill.
Taylor Communications – Delivers enterprise-wide printing, label and technical solutions. Based in North Mankato, Minn.
"Our winners of the Supplier Excellence Awards are helping us to grow, innovate, and become even more efficient," said Tom Plungis, Vice President and Chief Procurement Officer, Quest Diagnostics. "We deeply value our relationships with them." Quest Diagnostics empowers people to take action to improve health outcomes. Derived from the world's largest database of clinical lab results, our diagnostic insights reveal new avenues to identify and treat disease, inspire healthy behaviors and improve health care management. Quest annually serves one in three adult Americans and half the physicians and hospitals in the United States, and our 46,000 employees understand that, in the right hands and with the right context, our diagnostic insights can inspire actions that transform lives. www.QuestDiagnostics.com.